A medium size (5" - 6 1/2") member of the sparrow family, the Dark Eyed Junco sports a slate gray colored upper body with a white belly, sometimes the head is a bit darker gray than the rest of the body. It's eyes are black set against a slate colored head giving it the name "dark eyed". It has a stout, pinkish, bill that is very noticable against it's dark head. This tiny sparrow is easily identified by it's long thin tail with distinct white outer feathers that flash in flight or in an aggresive display. Females and juveniles look much like the males except that they are a bit paler and sometime have a mixture of brown in their plumage, but all the other marking remain the same. While you will see these birds in your back yard year round, they are ground feeders and most likely be under, not on, your feeder while feeding. Favorite foods consist of seeds, worms and insects. During the breeding season however they eat mostly insects which they regurgitate and feed to their young. Males start their courting in the early spring by singing from tall trees hoping to attract a female. Later, after finding his mate he will sing from atop a tall tree to declare his territory. The male and female Junco will build their cup shaped nest near the ground, either in the weeds or grass, a hollow tree root or log, or possibly in the lower branches of an evergreen tree. The female will lay up to 6 small, light colored, eggs with brown spotting and incubate them for nearly two weeks (12-13 days). Youngsters will leave the nest 9-13 days after hatching, but still are partially dependent on their parents for food. May breed 2 to 3 times during the spring and early summer each year. 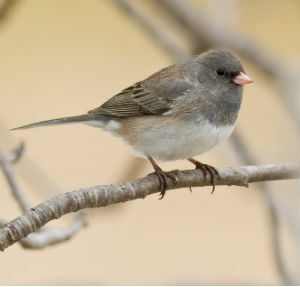 Dark-eyed juncos tend to winter in the same area year after year. Commonly referred to as snowbird because of its sudden appearance around winter bird feeding stations.